Prevents fine gold from floating in a gold pan or sluice. 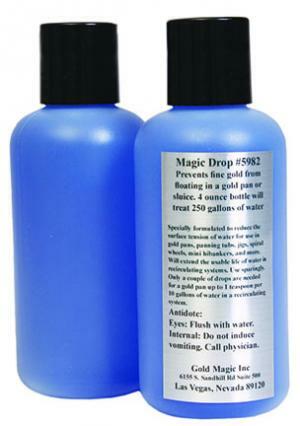 4 ounce bottle will treat up to 250 gallons of water. Specially formulated to reduce the surface tension of water with minimal sudsing. For use in gold pans, panning tubs, spiral wheels, mini hibankers, and more. Only a couple of drops are needed for a gold pan and up to 1 teaspoon per 10 gallons of water in a recirculating system. Use sparingly. Two bottles shown in photo in order to display back and front of same container. Price is per 4 oz. bottle.